Lamacchia Realty Inc. is happy to provide residents with leading real estate agents in Needham, MA. Whether you are looking to purchase, sell, or both, our team has worked in the area for years and understands that market better than anyone. As a popular suburb of Boston, Needham is a hot place to live for families and a convenient one for commuters. Lamacchia Realty is able to get you the results you’re looking for. Lamacchia Realty, simply put, wants to get your home sold at the best price possible and as quick as possible. The art of real estate is an extremely complex one. Through our years of growth and experience, we have created a fine-tuned selling process that is able to get our customers what they want. One thing that we do more than any other company in the area is MARKETING! We are very aggressive because we want everyone in the area to know that your house is for sale. From social media, TV ads, marketing on Google to local and international real estate websites, if people are looking in the area, they will find your home! Lamacchia Realty has real estate agents that walk through the entire buying process with you to make sure you are able to get the best home possible in Needham. You want to find a house that meets your needs and even more importantly, you don’t want to spend an arm and a leg for it. Please feel free to reach out to Lamacchia Realty to learn how we can help with your home search! Being a suburb of Boston, you can get from Needham into Boston with a simple 30-minute commuter rail ride. This makes the town ideal for commuters that work in the city. 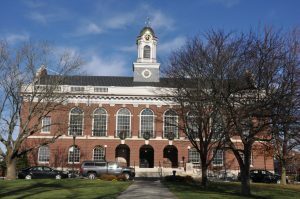 There are about 30,000 residents in Needham. While less than the surrounding suburbs, property values in Needham are relatively high. The median home value in Needham is $913,100. You’re paying for the outstanding school systems, proximity to the city and highways as well as how lovely the town is. Head outside and explore Cutler Park Reservation, the Needham Town Forest or the Hemlock Gorge Reservation. If you have kids, then they will be going to great public schools. Almost all of the schools have been rated a 8 or 9 on the 1-10 GreatSchools rating. As well, the high school has a 9/10 rating.